Painting a town scene featuring lots of buildings and architectural features may cause frustration if the detail looks splodgy and lines wonky. 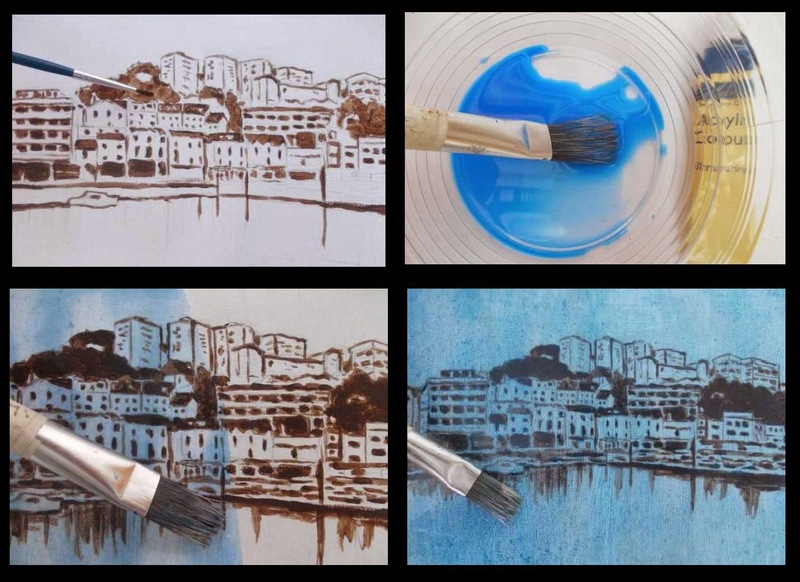 How can the artist paint a town or harbour without the detail looking messy and amateurish? Completing the painting in one go, causing the artist to rush the end through tiredness. The result may be brush marks that appear carelessly rendered in the form of smudgy lines or paint that bleeds into neighbouring colours. Not planning the underdrawing, causing mistakes to be inherited in the upper paint layer. No amount of artist precision will make up for an inaccurate drawing. Poor art materials, particularly cheap brushes with no shape or springiness. This will rob the artist of paint control, causing the pigment to go into unwanted areas. Applying the oil paint straight onto the white surface. 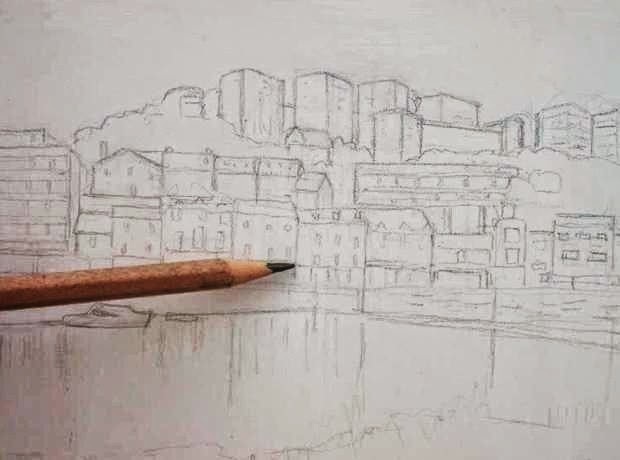 Unless the artist is supremely confident, a degree of guesswork will result in a scene that is not centred upon the art surface properly or an imbalance in tones. Another problem is that often, complex landscape scenes will feature darks and pales against one another. The result could be unwanted colour contamination within a small space. A messy painting may result. 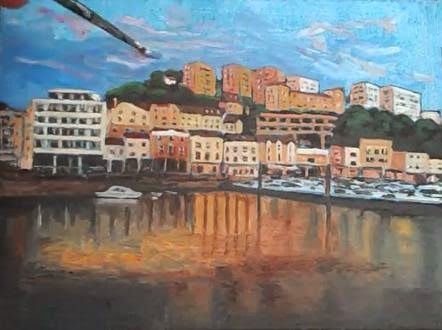 This demonstration features Torquay Harbour on the Devon Coast in the UK. To make the painting easier I had prepared two acrylic underglazes prior to the oil painting: one to kill the white gesso, the other to reinforce detail so that the drawing will show beneath the glaze prior to oil painting. Prior to these, an accurate drawing is essential. 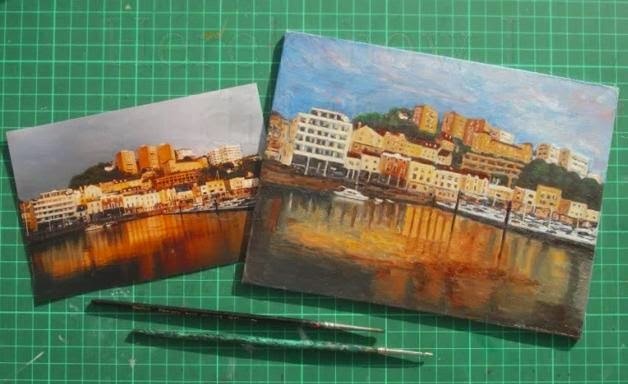 My art instruction YouTube clip shows how I prepared the underglaze for painting Torquay in Devon. Scroll to the bottom to see the second clip: the actual oil painting. When faced with painting an intricate coastal town, the following are essential: a, clear photograph, fine quality sables for detail: no’s 1, 3 or 6 will suffice. A smooth art surface (fine canvas is OK, but the grain can make drawing smooth lines tricky). I used primed MDF. Don’t use old oil paints that have thickened with time. Torquay Harbour posed challenges in that it presents lots of tight detail in the form of houses, windows, roofs and boat masts. Rather than complete the painting in one go, I did so in stages and on separate days. Each painting session lasted only an hour or so with breaks. Firstly, I conducted the underdrawing. Time is needed to get this right, but don’t go overboard with detail, as this will be covered with the oil paint anyway. I simply ensured the houses were drawn with reasonable accuracy and the composition centred upon the art surface in the way desired. A sharp HB pencil and eraser was used. So that the drawing will show through the glaze (to be applied next), I reinforced the drawing by overlaying the lines with dark brown acrylic paint from a fine sable. Illustrating dark areas serves another purpose in that it supports the oil paint layer. Don’t use dark lines on areas that feature no lines or pale areas, such as the foreground reflections and the clouds, as the dark acrylic will show through the oil paint. Once the brown acrylic paint was dry, I overlaid the drawing with three coats of diluted blue acrylic paint. The application of one wash often results in unwanted streaks and brush marks. Three coats will create a more uniform appearance to the underglaze. This means that the overlying oil paint (which comprised mostly of pales around the houses) will be easier to key in to the surrounding. Once the acrylic underglaze had dried, I began the oil painting, which was on a separate day. As can be seen, this preparatory technique means the artist is not faced with the prospect of laying colour straight onto a white surface or of guessing where to lay the paint. Fine sables are essential for detail such as windows and guttering. I used rounds no’s 3 and 6. Wider sables were used for the foreground reflections and the clouds. Always begin with the most exacting area whilst feeling up to it. In this case, I began with painting the pale house frontages with varying amounts of white, burnt sienna and cadmium yellow. Painting pale prior to dark means the dark cannot contaminate the pales. As can be seen here, the houses vary slightly in their cream tones. It doesn’t matter if the pale colour goes over the windows, as the dark brown acrylic paint shows through. Reinforcement in the form of dark oil paint can be applied later. This second YouTube clip shows the oil painting stage. Again, I began with the trickiest areas. I left the looser brushwork until last. This consisted of the sky and reflections. As can be seen, the huge challenge of painting towns with lots of buildings can be broken down into manageable tasks on separate days. In this case, the stages consisted of: the drawing (take time to get this right), overlaying the lines with acrylic paint, overlaying the composition with a series of acrylic glazes. Finally, the oil paint can be applied on a separate day via fine sables. Often, a touching up session is required once the oil paint is dry. This might be to sharpen detail around windows or straighten lines. A little linseed oil will help the paint flow.